Make the first move by sending a wink to six people in your contacts you may have your eye on. It’s completely anonymous and great fun. Remember, anyone receiving a wink from you will NEVER know it's you... unless you tell them! 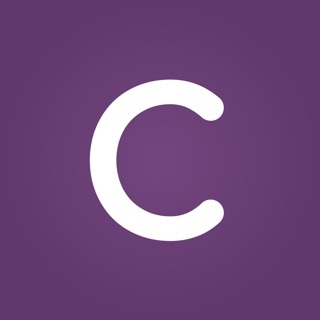 Download the app here and register in one step. We will never share your number. Import your address book. We can’t see your details and all information is safe. Choose six people you would like to wink at anonymously and send. All of them will get a text message that will tell them they received and a wink. 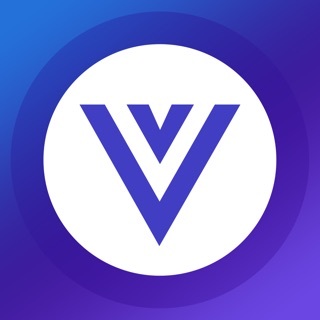 They will be asked to download the app and we’ll connect both of you in a chat room. The fun is neither of you will know who you’re connected to! You’ll get a notification to meet in a chat-room but, since you winked at six people neither of you will know who the other person is. You decide when to let each other know who you are. Then send six more. You can try wink at the same people or spread your wings. Remember no one likes a stalker. WHY DO I HAVE TO SEND IT TO SIX PEOPLE? If you could only wink at one person it would be unfair to them as there is a greater chance you would know who it is if you are connected. It also protects both sides from bullying. 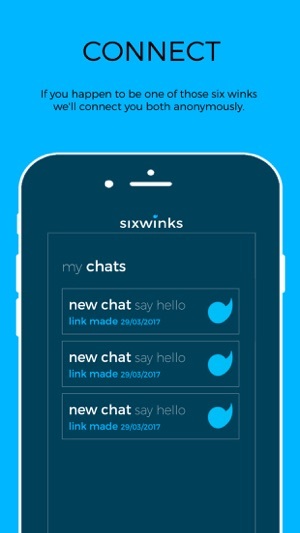 sixwinks is safe for everyone since the sender has to send to six people in their address book and will not know which connections have been made until a recipient agrees to reveal him/herself. But take care, even your friends can be weirdos. And for those weirdos there’s a mute button. If you receive a wink don’t assume it’s someone you winked at. You may be their secret crush. And similarly remember if there’s a match it may not be your crush, it could be anyone you winked at. Even pics can lie so be careful what you say in chat until you are sure you know who you are talking to. Speaking of pics, while they can’t be saved and will disappear after viewed, don’t send anything you don’t want someone to take a screenshot of. There’s no harm in winking at your crush a few times, but ease off the same people if you don’t get a response. For now, we’ve limited you to a set of six winks per 24 hours to stop you from harassing your crush! If, after a while you don’t get any matches, get a few friends together to all wink at each other and try and guess who you are all talking to. It’s great fun. If you arrange to meet someone, always tell a friend or a relative or, if unsure, take them along. And we suggest you stay away from the taken ones. Don’t say we didn’t warn you. Remember to stay safe and to do the grandma test. If it’s safe for her to see, then it should be safe online. Questions, feedback or any ideas on how to make sixwinks more fun? We would love to hear from you on info@sixwinks.com.